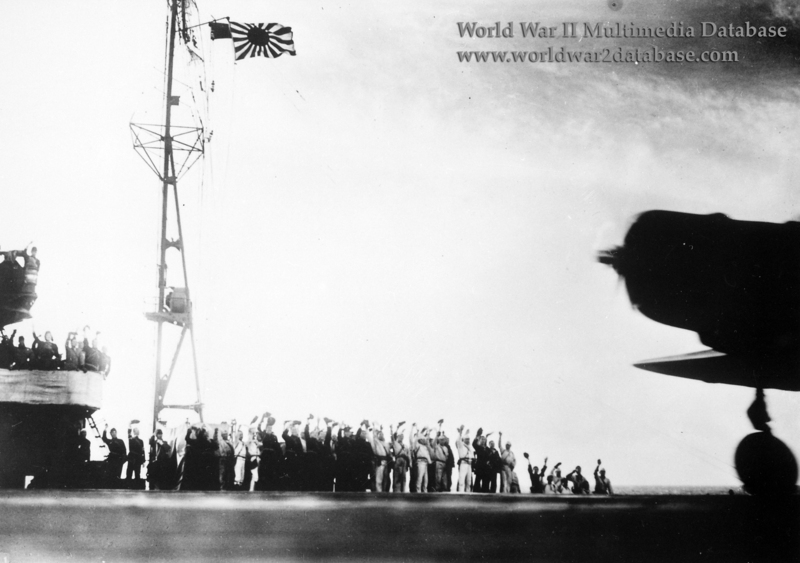 An Imperial Japanese Navy carrier, possibly IJN Shokaku, launches a Nakajima B5N2 Type 97 Attack Bomber for the second wave assault on Pearl Harbor on December 7, 1941. Note light tripod mast at the rear of the carrier's island, with Japanese naval ensign. A man has climbed up behind the spotlight. on the extreme left of the image, the man waving from the top level of the island is probably Imperial Japanese Navy Captain (later Rear Admiral) Takatsugu Jojima (June 20, 1890 - October 9, 1967) who commanded Shokaku during the Pearl Harbor operation. The second wave was led by Lieutenant Commander Shigekazu Shimazaki (September 9, 1908 - 9 January 9, 1945) from IJN Zuikaku. Four planes failed to launch with technical problems. The first group of fifty-four B5N2s with 250 kilogram (550 pound) general purpose bombs and 60 kilogram (132 pound) general purpose bombs split into two groups of twenty-seven planes to bomb the airfields. 81 Aichi D3A type 99 dive bombers, armed with 250 kilogram (550 pound) general purpose bombs, attacked the battleships and carriers. Thirty-six Mitsubishi A6M2 type 0 fighters provided top cover and strafed targets. With the American defenses alert and personnel at their guns, the second wave lost eighteen aircraft to fighters and ground fire.